Palestinian children who had been detained by Israeli occupation forces say that they were beaten and humiliated inside Israeli prisons, according to Days of Palestine. 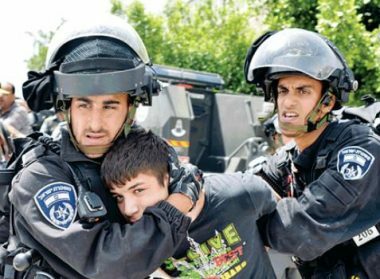 Defence for Children International – Palestine (DCIP) is concerned that Israeli military arrests are not only violent, but that children often lack proper legal representation during the court process, and that the impact of detention lasts well into adulthood. Fawzi al-Junaidi, the 16-year-old Palestinian boy whose detention, while blindfolded by a group of Israeli soldiers in occupied Al-Khalil, was captured in a photo that went viral, spoke to Al Jazeera about how he was treated in Israeli custody.